What was eating the parsley? 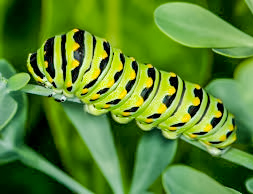 There it was, a handsome fat green caterpillar, with black bands spotted with yellow. Mai wondered what kind of butterfly it would become. She found an old fish tank. In it, she put the caterpillar, a branched stick, and a handful of parsley. She then covered the tank with a screen. The caterpillar quickly began munching on the parsley. A few days later, the caterpillar climbed the stick that was inside the tank. Clinging with its lower feet, it then spun a fine silken thread, that it looped around its upper body like a sling. Leaning back, the caterpillar began to wriggle. Its skin split open, and it subsequently fell away. 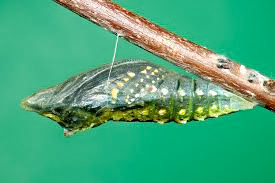 The new skin underneath transformed into a colorful hard-shelled chrysalis. One day, Mai noticed that the chrysalis was becoming transparent. As she watched in amazement, the chrysalis began to move. Suddenly it split, and a butterfly pulled itself out. It grasped the stick with long and slender legs. Its tiny wet wings were blue, edged with black. The butterfly began to pulse, rhythmically, and its wings expanded. 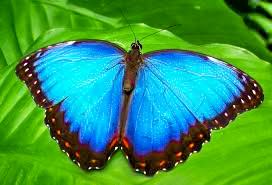 Mai identified it as a Blue Morpho. She carried the butterfly outside, on the stick. It continued to cling to the twig, while waving its wings gently in the breeze. As Mai observed the beautiful creature, the butterfly fluttered up and away, now free to explore its newly discovered surroundings. 2. Why did Mai keep the caterpillar in an old fish tank? 4. What happened just before the chrysalis began to move? 5. What happened when the butterfly appeared?